It began with just an occasional ant. Big ones. One on the kitchen counter. Another in the sink. Two in the bathroom. That was early February. It was another couple weeks before I realized a movement was afoot. By March we had gone from a half dozen ants a day to scores. 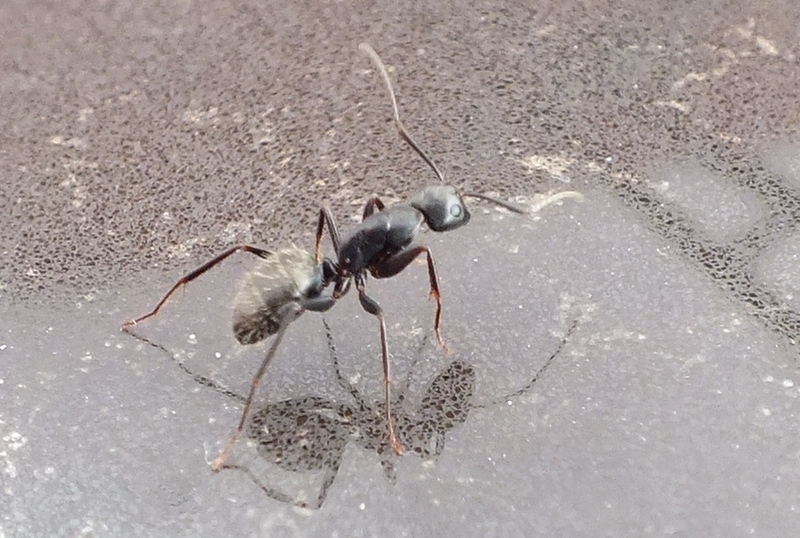 A worker ant crossing my kitchen counter in search of food. This is a carpenter ant, probably Camponotus pennsylvanicus, the very common black carpenter ant. Then one night I left a can with a half inch of tonic water in it on the counter. The next morning it was crawling with ants. The same thing happened a few nights later with a glass in the sink. The final straw was finding they had fully invaded my loosely sealed jar of honey. One morning in the sink. These are all workers. Now, you all know me. I’m patient with visiting wildlife. I carefully relocate spiders and wood roaches to the outdoors. I gently shoo snakes out of the garage. I allow snapping turtles to nest in my driveway and then hand-carry the hatchlings to the swamp. But these ants were becoming a bit much. aw yeah…Nice ants, unless they eat your house! Sean was only kidding about actually eating my house. Carpenter ants excavate moist dead wood to make living quarters, but, unlike termites, do not eat wood. In the wild, carpenter ants nest in damp logs, stumps, and hollow trees. They carry on an important ecological role in aiding the decomposition of dead and dying trees. In fact, all of the ant extermination websites advise removing logs, firewood, and other sources of dead wood from around your house. That’s a great idea, but impractical if you live in the woods like I do. The main colony of our ants probably resides in this tree which is about 50 feet from the house. 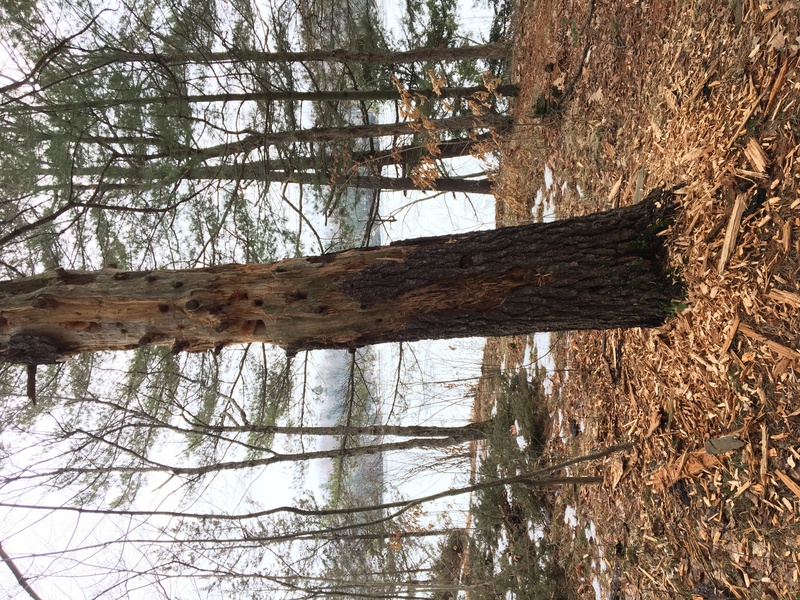 It’s no accident that our resident pileated woodpeckers visit this tree almost daily. They love carpenter ants! The main nest houses the queen (one or more depending on species), males, and non-breeding female workers. It also serves as the nursery. The colony sends out workers to establish satellite nests in places (like my house), where they sometimes care for the older larvae and pupae that can survive drier conditions. They also build extensive underground tunnels. So the question was, how to get rid of them? 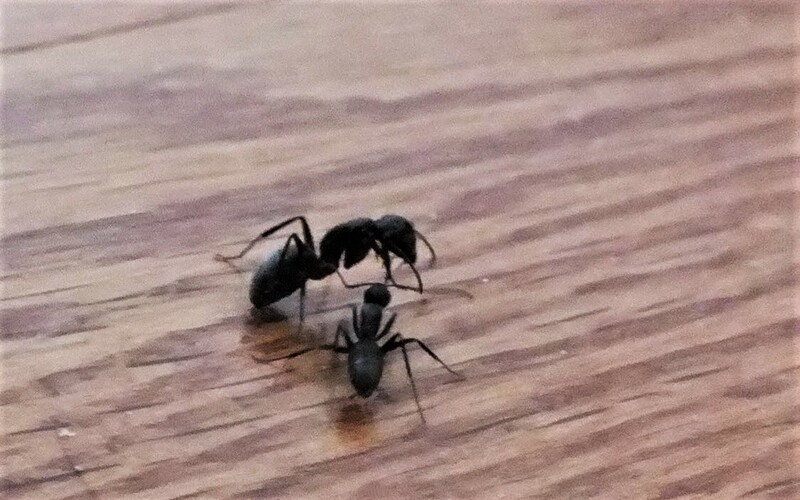 One way is to call an exterminator and have them use some scorched earth method to eradicate the ants and everything else that might reside within and around the walls of the house. But something about exterminators bothers me. I decided to go it alone, so the first step was to understand the ants. Ants are fascinating creatures. Because they are so common, we somehow forget that. Our mindset is something like, “Yeah yeah, they have a queen, they’re social insects, they work together, whatever.” But when you stop and think about what that actually means, it’s kind of mind-blowing. Carpenter ants have strong mandibles for creating galleries and tunnels in wood. These open laterally, like pincers, rather than up and down. Click the image for a closer look. Every ant crossing my floor was on a mission, not just to find food for itself, but to help the colony survive. It has communicated with the other ants, knows where to go, and will pass information to the ants it meets along the way. That became apparent as I watched them. Two ants would meet up along the baseboard of my living room and they’d stop and seem to greet each other. 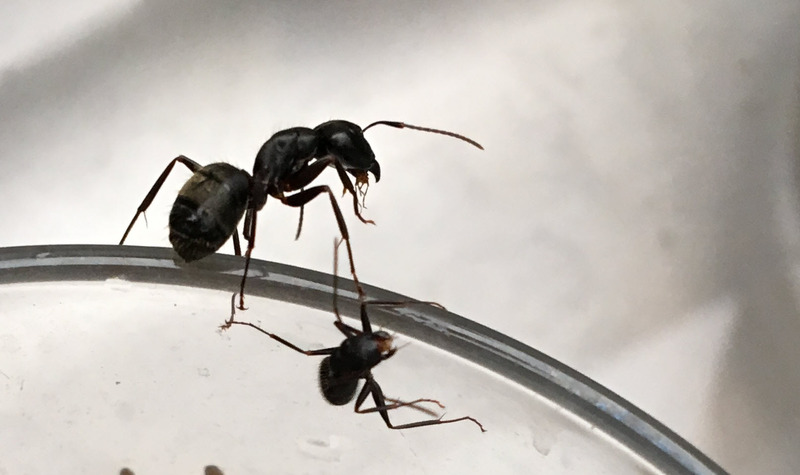 But this was more than just a “hello.” Carpenter ants (like many other ants) swap social information during these exchanges. 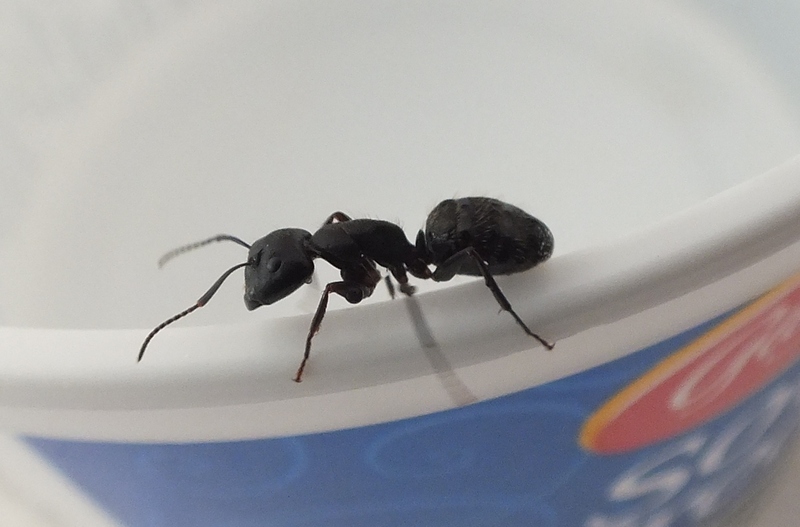 Click to see this ant carrying food it found in my kitchen sink. One way ants share information is by exchanging food mouth-to-mouth in a process called trophallaxis. Food sharing provides odors and tastes which the ants associate with specific food sources. 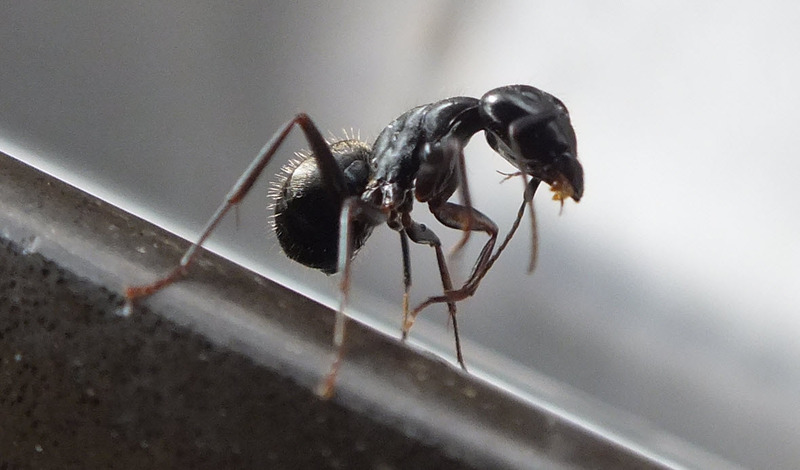 The main means of ant communications is their antennae which have hundreds of receptors for odors, tastes (including pheromones), and toxic compounds. Ants also use their antennae to “taste” the body surface of other ants to identify nest mates and receive instructions. In addition they use them to detect ‘danger’ pheromones and chemical trails other ants have left to promising food sources. So Step 1 was cleanup. 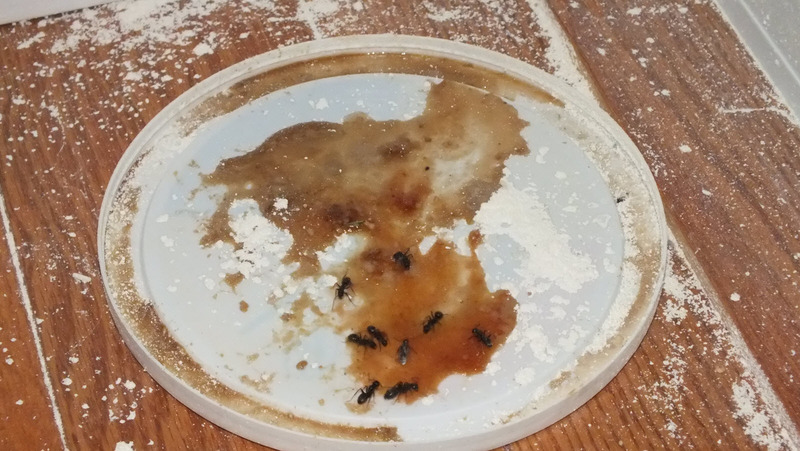 The ants were particularly attracted to sugar I noticed, so I thoroughly cleaned cupboards and counters, made sure tasty food like honey and other sweet goodies were sealed up properly. The next step was to erase their trails. This ant is doing one of three things: exploring, following a trail or leaving one. Judging by its location and direction of travel, I would guess it’s following a well-worn path. When ants find a food source, on their return trip to the nest, they lay down a chemical trail to lead other ants to the bounty. 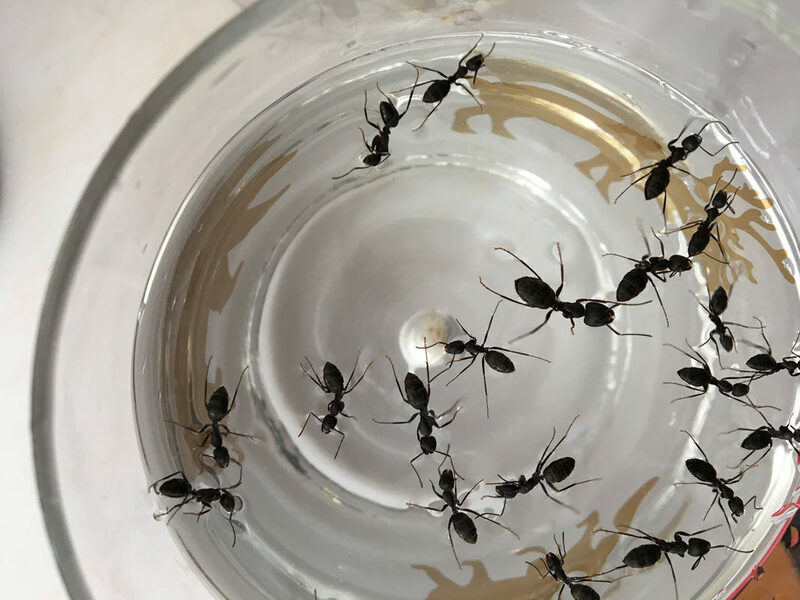 Large food sources means more ants leaving a trail, which gives other ants information about the quantity of food available. As the food source decreases, fewer ants leave trails until the food is gone and the trail fades away. In watching the ants and their direction of travel during different times of day, I could tell where the trails were. They ran from under the fridge and along the perimeter of the house. At night they’d come out. In the morning they’d go back. There was a strong trail up to the cupboard where the honey jar had been. Every day I had ants on the wall heading that direction. The trails had to go. But how? Nobody had a definitive answer (research project anyone? ), but I decided vinegar was worth a shot. Plus, it’s relatively non-toxic to humans and wouldn’t ruin paint or woodwork. So I washed the floors, baseboards, cupboard doors, and walls — wherever I had seen ants traveling. But cleanup and removing trails wasn’t going to be enough. Ant satellite colonies can have hundreds of workers, with new ones maturing all the time. If there was a colony living under or within my house, I had to eradicate them at the source. And since I couldn’t find that source, I had to rely on the ants to do it for me. Again, weighing the options for various insecticides, I settled on the least toxic to humans and other creatures — diatomaceous earth. Diatomaceous earth is interesting in itself. It is a powdery sedimentary chalk-like rock formed of fossil diatoms. 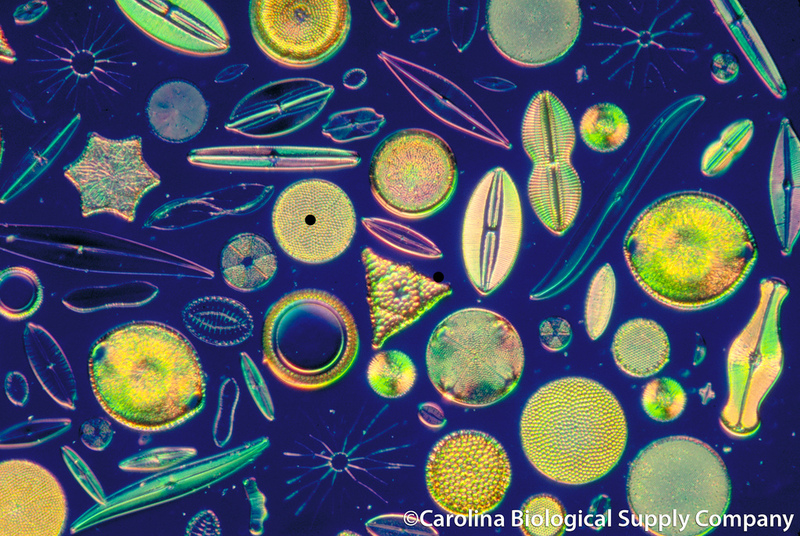 Diatoms are algae that have a cell wall made of silica. The silica gives diatomaceous earth glass-like abrasive qualities at the near-microscopic level. When the powder comes into contact with the ants’ exoskeletons, it scratches and abrades, causing the ants to dehydrate and eventually die. But not before they carry the powder back to the nest. So what followed were a series of “La Brea Tar Pits”, where I tested out various baits and distributions of diatomaceous earth in hopes of luring the ants and covering them in dust. And what followed that, were weeks of dusty ants staggering all over my house and dying everywhere. Every morning I’d get up and sweep up the living and dead and toss them into the snow, where they’d quickly freeze. Then, throughout the day, I’d walk the indoor perimeter and sweep up stragglers. During this time I also sealed up potential ant entrances to my house, but to be honest, there really wasn’t anything to seal. As you might recall, this house is sealed to passive house level. So I have no idea how they got in to begin with. I also have no idea if they were a satellite colony living indoors or if they were somehow travelling to the house from their main nest … in the middle of winter .. under the snow .. on land made largely of granite…through the impermeable membrane that wraps around my house. Meanwhile, hundreds of ants were dying and equal numbers were presumably making it home covered in deadly dust. But their numbers weren’t dropping. They marched through March and into April. I removed all the bait which only seemed to encourage them, and distributed diatomaceous earth in strategic places. We went away for a week in early April and when I came back the place was littered with bodies. I gave the house another clean sweep, washed floors, and once again applied dust. And then, four days later, I woke up and — no ants. Was it anything I did? I don’t know. Maybe I killed off a satellite encampment. Or maybe, once the weather warmed and ground thawed they simply moved out. Will they be back next year? I don’t know that either. But for now the March of the Carpenter Ants is over. PreviousGood news for Ontario snappers! The liquid was brown sugar and water. That was a mistake. Don’t bait them. It just encourages them. The powder I used was just store brand “crawling insect killer.” Look for “diatomaceous earth” on the label or in the ingredients list. They did! But not nearly the numbers I had last year. I didn’t put out any bait. When I saw the first ant, I sprinkled the powder in corners (especially under the lower kitchen cabinets), under the edge of the fridge, and along some walls. I also sealed a few cracks where I saw them emerge; bought a sealed compost container for the kitchen (rather than use the regular bin); washed the kitchen floor frequently (thank you Roomba); and killed every ant I saw, on sight (sorry ants). I would guess, overall numbers were 25% of last year, but timing and duration were about the same. I think we are down to the last week or so now.